Limitations of two-dimensional (2D) measurements. 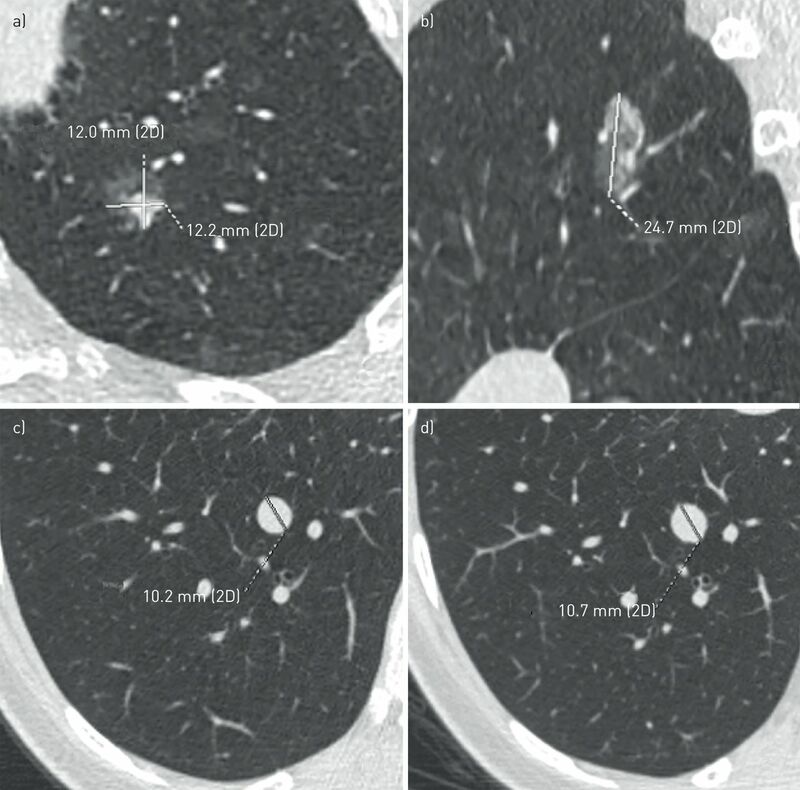 The axial diameter may not be the maximum one in the evaluation of lung nodules. a) A small part-solid nodule in the apico-posterior segment of the left upper lobe, with a maximum axial diameter of 12×12.2 mm; b) the sagittal multiplanar reconstruction shows that the largest diameter of the same nodule is the sagittal one of 24.7 mm. The multiplanar evaluation of nodule diameter is especially important to document asymmetrical growth of nodules. c), d) The low level of agreement when measuring small nodules: for the same nodule in the right lower lobe two different diameter values have been reported by two readers. Considering the nearest whole diameter of the two values, it results in 1 mm difference in the maximum diameter, a significant difference when considering small nodules. Disagreement in measuring the solid portion of a part-solid nodule when using different reconstruction algorithms and window settings. A part-solid nodule in the apical segment of left lower lobe is shown. 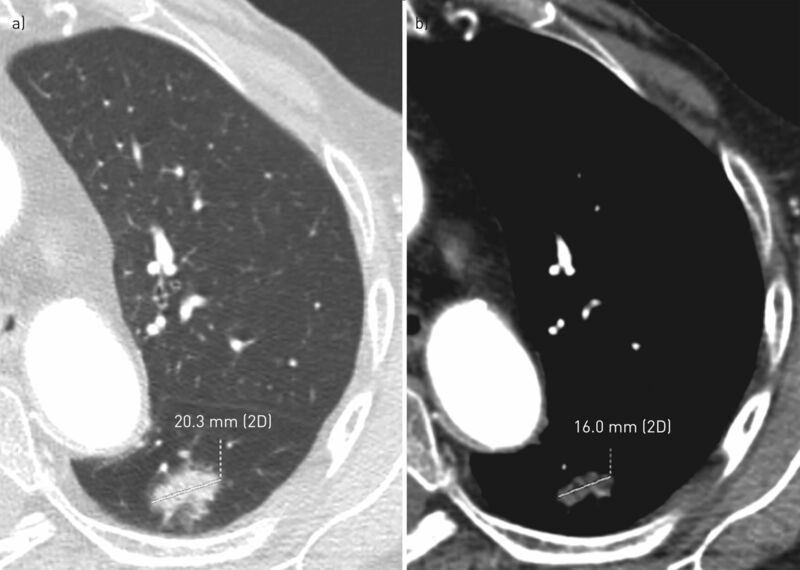 a) By using a high-spatial frequency algorithm and the lung window, the measured maximum axial diameter of the solid portion of the nodule corresponds to 20.3 mm; b) by using a smooth algorithm and the mediastinal window, the measured maximum axial diameter of the solid portion of the nodule corresponds to 16 mm. 2D: two-dimensional. Volume evaluation during follow-up allows the detection of nodule growth over a shorter period of time compared to diameter estimation. 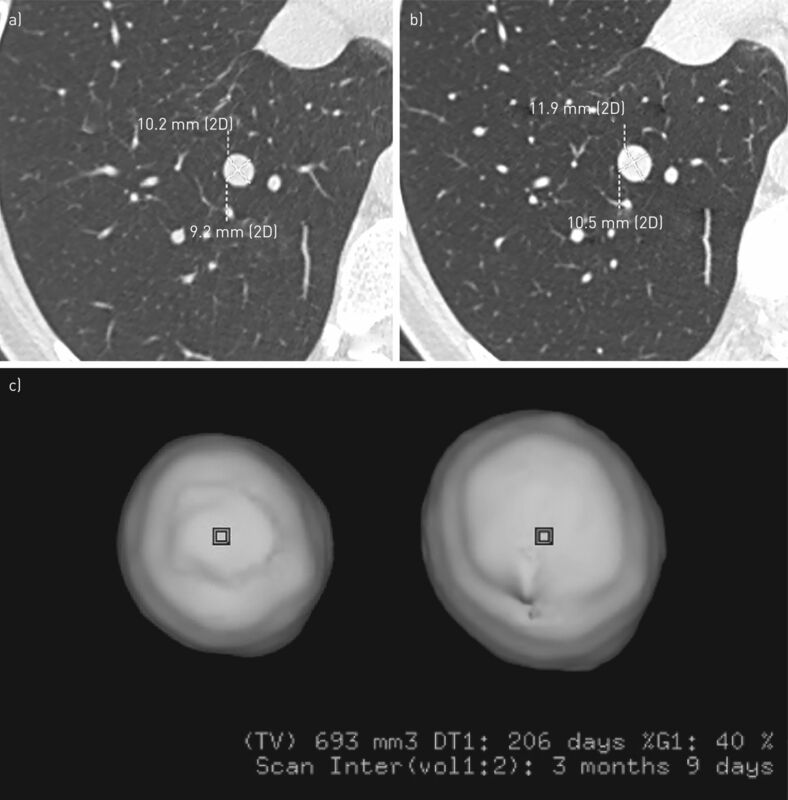 a) Computed tomography (CT) axial image shows the same nodule located in the right lower lobe as reported in figure 1c; b) a 3-month follow-up axial CT image demonstrates minimal change in nodule diameters; c) conversely, nodule volume calculation using a three-dimensional (3D) volumetric method demonstrates a significant increase in volume within the range of malignancy. Histopathology revealed a carcinoid tumour. 2D: two-dimensional; TV: total volume; DT: volume doubling time; %G: volume increase; scan inter: scan interval. Squares in the nodule represent the starting points of the 3D analysis.